New member Victor Timmons from Highbridge in Somerset, England, has kindly offered us this delightful reminiscence of a chance encounter a near-quarter-century ago. “In 1993, while I was living in Brighton, I visited my doctor, due to a minor ailment. When I entered the comfortable, old-fashioned waiting-room, with its baby grandfather clock ticking reassuringly in the corner and the daily copy of The Times lying on the table, there was only one other person in the room, whom I recognised right away. 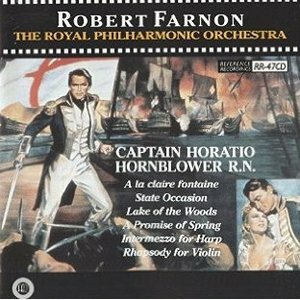 It was romantic leading British actor of the fifties, Terence Morgan, co-star, as 2nd Ltd. Gerard, in the 1951 film Captain Horatio Hornblower, RN, based on C.S. Forester’s series of stories about the Napoleonic Wars. When he saw that I knew who he was and I had made some remark to that effect, he stood up immediately and walked towards me, offering me his hand, saying, “Morgan”. I told him that he was in one of my favourite films, Mandy, made one year after Hornblower. Afterwards, we talked briefly about his movie career, of which he had a rather modest, self-effacing opinion, and when I mentioned, somewhat awkwardly, that he was very good-looking in those days, he retorted that good looks weren’t talent. I felt at the time that he was being a bit hard on himself but then he added, with some obvious pride, that he was in Olivier’s 1948 Hamlet, in which, at 27, he made his successful film debut as Laertes (not, alas, Horatio!). As in Captain Horatio Hornblower, RN, he looked comfortable in costume parts and was “daring, dashing and tempestuous” as Laertes according to his obituary in The Guardian, and was the first actor in the part to receive fan letters from teenage girls. When we talked about Mandy, he was effusive in his praise of the Manchester school for deaf and dumb children where the film was made, and said that the staff did a wonderful job there. In Captain Horatio Hornblower, RN, he played the third lead after Gregory Peck and Virginia Mayo. Although handsomely made in colour, the film was only partly successful in my opinion, due to the choice of director and the main stars, compromised by the phoney studio-bound effects. Hollywood director, Raoul Walsh, seemed an odd choice, even though he had previously made two excellent gangster movies, White Heat and High Sierra, the former co-starring Virginia Mayo, Gregory Peck, as the eponymous hero, delivered his standard wooden performance and gave a new meaning to the English stiff upper lip. As much as I like Virginia Mayo, she was, unfortunately, miscast as Lady Barbara Wellesley. When Gregory Peck originally suggested to Raoul Walsh that Margaret Leighton would be ideal for the part, he was told that she didn’t have any t**s! Who knows what the great C.S. Forester would have made of that remark? The musical score, however, by Canadian composer, Robert Farnon, was outstanding, with a stirring, nautical main title and a particularly beautiful lyrical theme for Lady Barbara. It’s available on Dutton Records and also on Reference Recordings. It’s just a pity that he didn’t write any more dramatic film music like this one. Coincidentally, Hollywood’s 1957 film version of Forester’s novella, The Gun, about an imaginary incident during the Peninsular War, The Pride and the Passion, also had a superb, evocative score by Hollywood bad boy, George Antheil, who, sadly, never reached those heights again either. Terence Morgan was retired from film making when I met him and was then the owner of a hotel in Brighton. When I enquired about life as the proprietor of a hotel, he replied that it was fine as long as you didn’t employ any staff! The great Billy Wilder himself might have liked that answer! “I sent a copy of my e-mail about my meeting with Terence Morgan to Dutton Vocalion records as it mentioned their excellent recording of Captain Horatio Hornblower, RN and they very graciously and kindly sent me a free, sealed copy of the CD. It’s worth getting for the 19 minute suite alone of Hornblower, with John Wilson, who appears regularly on BBC’s Proms film music concerts, conducting the BBC Concert Orchestra. The CD has a generous playing time of 77 minutes and the rest of it includes other music by Robert Farnon, a symphony and several shorter pieces. I recommend it C.S. Forester members if only for the Hornblower suite but the other tracks are very pleasant too. It’s just called Robert Farnon and is on Dutton Epoch CDLX 7173 at around £10.99. There is a longer suite of the music, at 21 minutes, on the American Reference Recordings label, with the Royal Philharmonic Orchestra conducted by Robert Farnon himself, on RR-47CD, with an attractive painted cover in action from the film and an inset with Virginia Mayo. 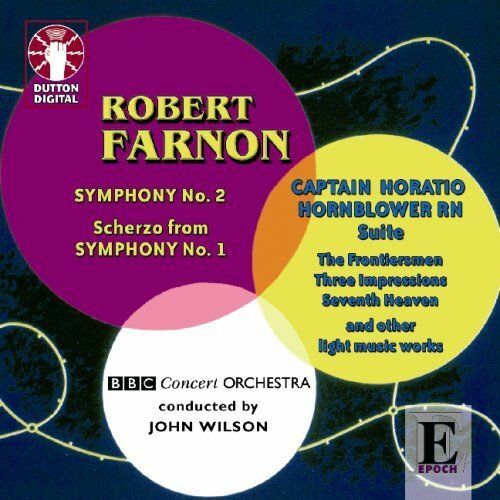 The remainder of the CD has other Robert Farnon recordings, which are entirely different from the Dutton and include a Rhapsody for Violin and Orchestra plus some more attractive pieces. The total playing time for the Reference is 67 minutes. The Hornblower suite has exactly the same tracks as the Dutton but is played at a very slightly slower pace overall, hence the extra two minutes.